Today, I made a card for a young man in our neighborhood. He was assaulted recently and just made it home from the hospital. He helps hubs out occasionally. We have known him for several years, and he is a good kid, not so much a kid now (20). So I needed convalescent card and a masculine one as well! In June I had promised to make him a throw blanket with his favorite NFL team fleece in time for football season. Since I just finished it a week ago, I decided it was a good time to give it to him and maybe cheer him a little -- along with a cute but definitely masculine card to let him know we are thinking of him and wishing him a speedy recovery. Fortunately two challenges have themes that can easily be maculinized (is that a word?). 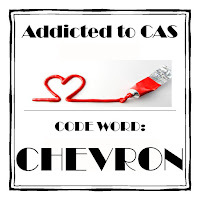 I used the theme from Addicted to CAS - Chevron, and the sketch from Freshly Made Sketches-197. I chose masculine colors and I think it turned out quite well. Supplies: MFT Chevrons, scraps color card, Paper Smooches Get Well Soon stamp set, Copics, Pretty Pink Posh Stitched Banner Duo. I missed the last class at Online Card Classes, so I made sure to sign up for this one. I had some mixed feelings the first day when I reviewed the scheduled lessons. I wasn't sure I liked the new format. The first two days were all about technique, and the third day was a day for putting those techniques to work as cards. I thought posting my homework for the first two days would be meh, so I've created some photo collage's of most of the homework bits and the cards that resulted from them. The homework panels are half of an A2 sized card, and each of the cards made are no more than 2.75 inches in any direction. I usually only make card fronts for homework, because I save them in a binder with the lessons. This time I chose to make mini cards...guarantees they are cute - right? Day three really pulled it all together for me, creativity wise. I am glad there were two technique days (and stuff gets to dry well) then a day to create cards. Sometimes it can be overwhelming taking a class and keeping up with homework. This really worked well for me, I really enjoyed the process and am looking forward to the second round. I absolutely cased the designs from the instructors, Kristina Werner, Jennifer McGuire, and Laura Bassen. My plaid building needs a lot of work, but I was so pleasantly surprised when blending non distress dye inks. SO MUCH FUN, and just beautiful color washes. I will definitely go back to these techniques for future cards. I have two cards for two related challenges--one of which is brand new. I love this shade of purple/violet with gold. I heat embossed some circles, and then added the sentiment. I cut down the circle panel and mounted it above the sentiment. Next Up the new challenge from Cas-ual Fridays CAS-ual Chic, and their first challenge. I've added lots of layers to this version. 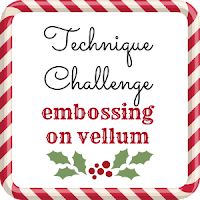 Dry embossing with a Stampin Up embossing folder, then a panel gold embossed with more circles. Finally the sentiment strip is also mounted with foam. A bit of gold string finishes the card. Both cards us the Casual Friday's stamp set Big Thanks. I tried some center ink blending and then stamped & embossed 3 leaf branches and some loose leaves in the area. My sentiment die cut rests across the leaves. There is a thin black mat between the card front and the base. My stamp set is from Paper Smooches, and the die is from Simon Says Stamp. Papers are from Neenah and Stampin Up. One Layer Christmas Card Challenge, is always tough. I am so used to using a card panel on top of a card base. For this card, I embossed my front panel and used a diffuser, so that the was a smooth part left on the card after the dry embossing. I filled that space with a sentiment from SSS Holly Berries, and a sweet little lantern with a candle from DeNami Designs. Coloring was done with Copic's. Muse Christmas Visions is the inspiration for the next card. I also used Lawn Fawn's Joy to the Woods stamp for this card. I was inspired by the watercoloring and the stacking. I used Distress markers to color, and a memory box die for the gift pile. The second challenge card is for 52 Christmas Card Throwdown. I used the Joy to the Woods Stamp set from Lawn Fawn along with Hero Arts gold embossing powder and a gold glitter pen. The vellum sheet was adhered to a kraft A1 sized card base. I've stacked up the Christmas card challenges again, and instead of posting them all together, I am posting each one separately. 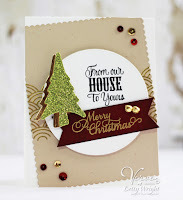 I used one of my favorite holiday stamp sets from Simon Says Stamp Holly Berries. Instead of stamping pine cones on the pine branch, I put triplets of hearts. I cut the card panel down a bit and mounted it on a green card. And I also made a set of three cards with the coverplate die cuts she sent. Her original was gorgeous and I loved what she did. I had a bit of trouble deciding what I wanted to do. One card is watercolored, one is colored with embossing powders, and one I left alone. Thanks again Greta, I had fun playing, and learned that cover plates are not so much in my wheelhouse...the extra bits were easier for me to use to put together. See what happens when crafty friends share? I have a friend, my scrapping bestie who loves Paris, so each year I try to include the Eiffel Tower on her birthday card. This is the 2015 version. Hubs brought in the mail today, and there was a packet with new crafty items. For once I immediately played with the stamps. These Peonies from Avery Elle are drawn so nicely, and I loved coloring my stamped image. When I was finished, looking at the card, I really get a 3D effect; hubs came by and said it looked like 4 layers, when I handed him the card, he was surprised. Yes the blossoms and leaves are just one layer...I have to credit that to using Sandy Allnock's Hex Chart. I never would have put YG63 and G43 together on the leaves without that chart. I am entering this card to two challenges, Leslie's Crooked Stampers Sketch Challenge-6 and Avery Elle's AEHeartU Challenge-Sparkle. Supplies: Copic Markers, Hex Chart, DCWV glitter paper, Avery Elle's Peonies Stamp set, Embossing Powder, Memento Ink, Versamark ink, black cardstock scraps. While I was out shopping one day, I saw a gift bag and thought it might be a great card design. I could have used flowers, but decided on butterflies instead. It took a couple of hours to stamp, mask, color, retrace, fussy cut, line in black marker and put the card together. SO totally worth the time~! Here is the close up of the wink of stella, these butterflies are so pretty in the light. I made this card for the AEIHeartU Challenge - Sparkle. I read the rules, and it requires Avery Elle stamps, but I didn't see that it was for exclusively Avery Elle products, so I am taking a shot entering this card. 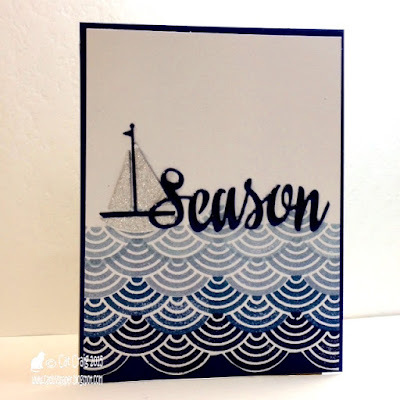 I have loved that fanfare border, from the Fanfare stamp set by Avery Elle for a long time, and my die cut is "Season" edited from Avery Elle's Seasons Greeting die. 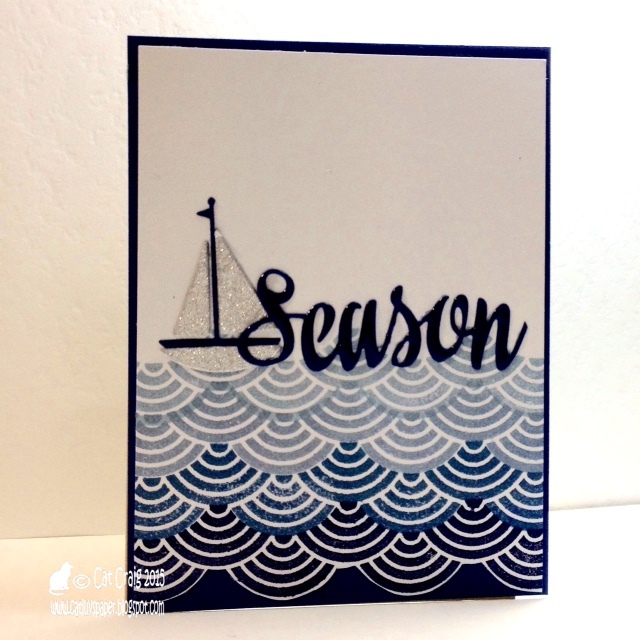 Its kinda tough to see, but season is covered in wink of stella and glossy accents for a wonderful navy die cut that has depth and sparkle. The sails and boat hull are cut from DCWV glittery paper. 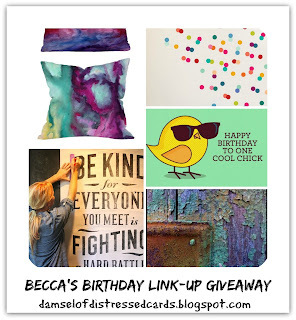 I follow Becca Cruger's blog and I absolutely wanted to play in her birthday mood board challenge. My inspiration is from the pillow and the lower right distressed paint photos. I started with watercolor paper and created a backdrop with some blues. After it dried I added some light green leaf shapes with a stencil and embossing paste. The flower image panel was roughed up on the edges and crinkled a bit. I stamped some random words from a hero arts stamp set in coordinating colors. Becca and I exchanged a few supplies recently, and I used a bit of the lace she sent up in the corner. To anchor it down, I used my beloved purple button, that I have been holding on to FOREVER...it just seemed to me it belongs on the card. This attempt at mixed media/distress is not my comfort zone at all, but it was a lot of fun trying to mix the simple flower with a rougher style. Happy Belated Birthday Becca, thanks for the fun challenge. ETA: Adding this to the Mixed Media Challenge - Blue. Thanks Becca for the suggestion. I haven't done a lot of paper piecing...probably because I truly do not like fussy cutting. Today I am in the mindset of trying things I don't often do, so I gave it a shot. I bought this birthday set -Unforgettable- by WPLUS9, because those elephants were just too adorable. While it is a birthday set- with a little editing, and you have something else. My sentiment stamping leaves off the last line ("It's your birthday that's hard to remember") of the stamp. I loved Ardyth's whimsical flowery card for this week's Muse. Those glittery yellow centers, and the blue sky were my inspiration. I started with a Kraft 4-bar sized card. I've been playing with Clearly Besotted's new Miniature Florals stamp set. It has all those wonderful CB flowers in small size. LOVE! I chose to color with Prismacolor pencils, I added some yellow wink of stella and a bit of glossy accents to highlight those yellow centers, and provide a bit of tactile interest. Don't ya just love how some cards feel? A bit more glitz in the glitter strip below the sentiment. The sentiment comes from Simon Says Stamp artful flowers set. This was a fun card to create, I don't think I have done much coloring on Kraft...I might have to revisit this, soon. Playing with a new embossing folder from We R Memory Keepers and some bits and pieces of die cuts Greta sent me (thank you!). I colored them with the Zig Clean Color Real Brush tip markers. Then added some wink of stella and followed that with clear embossing. I love how it makes those flower pieces look. I went old school and colored some clear gems to match with a copic marker. My sentiment comes from Simon Says Stamp You along with the die cut. The ribbon, gems and the card stock are from SU. I recently purchased Clearly Besotted's Miniature Florals. I love these sweet images. They are SMALL. So when I saw the sketch for Cas(e) this sketch #132, this card immediately came to mind. The image is stamped and embossed in Ranger's Liquid Platinum embossing powder. The sentiment is layered via vellum and the sentiment comes from Simon Says Stamp - Sketchy Banner Greetings. Coloring was done with Zig Clean Color Real Brush pens and lots of water on a paint brush. It has been hot, humid and to this transplanted Southern California desert dweller just miserable. I love the seasons, but I despise the humidity. Couple that with bouts of insomnia and my mojo went on vacation! It has been about 8 days with very few cards made or contemplated. 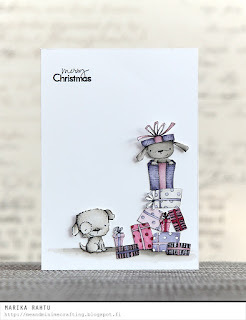 Today, I sat down to work on three Christmas Card Challenges-a mini marathon of card making. I like to group them all in one post, so about every 2-3 weeks I have a 3 for one post. The challenges are Merry Monday - Penguins, One Layer Christmas Cards -Anything goes with option of gift(s), and Muse Christmas Visions #11 an inspiration challenge (I loved the fresh color combo). Do you clean up between each card, or do you have a marathon with all parts strewn about? When I scrapbook, I clean up completely between each set of pages, even when at a crop. Cards....oh it could be 2-3 4 before I give myself a clean work area...maybe because they are smaller formats. Then terrified -- after I excitedly accepted Melissa's invitation (Thank you!) to be a guest designer for this week's theme at CAS-ology. A card design popped into my head immediately! I chose to make a square card, then repeat circles throughout the design. Supplies: Dies by SSS (Smile, Bubble Parade), Stamp by SSS (Happy & Smile), Cardstock SSS-Sunshine, Patterned Papers - Doodlebug. Size 4.25" by 4.25". 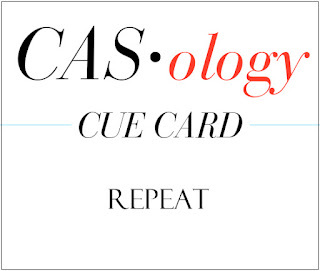 Thanks so much for stopping by, and head over to CAS-ology by clicking on the cue card above and give it a try!